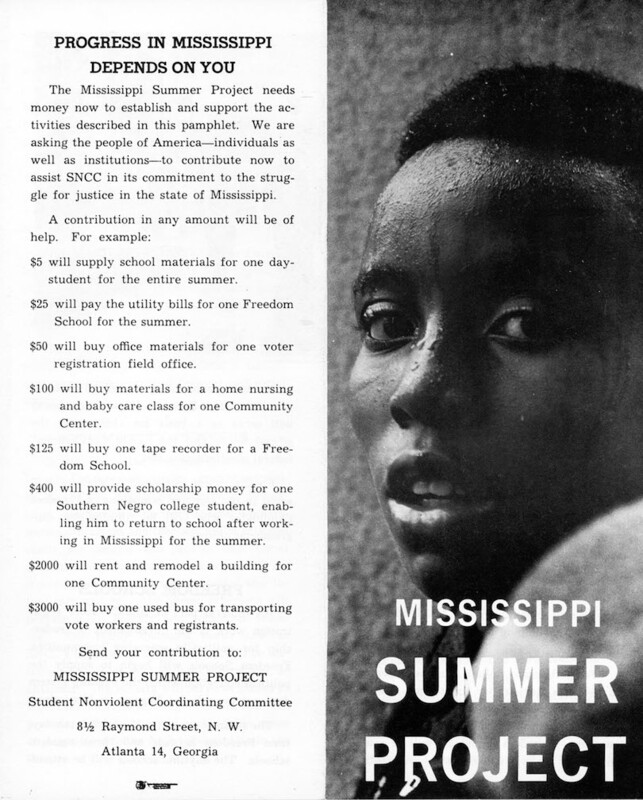 The Mississippi Summer Project of 1964, known as the Freedom Summer Project, sought to use multiple methods to change race relations in the state. An effort primarily of the Student Nonviolent Coordinating Committee, the National Association for the Advancement of Colored People, the Congress of Racial Equality, the Southern Christian Leadership Conference, the National Council of Churches Commission on Race Relations and its Delta Ministry, and the Medical Committee for Human Rights, the Freedom Summer Project brought to Mississippi more than 700 college students from thirty-seven states, 150 experienced civil rights workers, and 100 clergy. In addition, 150 lawyers, doctors, photographers, and others worked with specific groups to provide legal services for civil rights workers, provide health care for indigent African Americans, and document the civil rights movement via photographs. The Freedom Summer Project began with a two-week training session at the Western College for Women in Oxford, Ohio. One week focused on voter registration, while the other provided guidance on working with the freedom schools. Volunteers also participated in workshops and heard speeches by veteran civil rights workers. Mississippi’s whites greeted the arrival of the summer volunteers with violence and a military-style buildup. On 21 June 1964 volunteers Michael Schwerner, James Chaney, and Andrew Goodman left their local Congress of Federated Organizations Office in Meridian to investigate the burning of Mount Zion Methodist Church, an African American church in Philadelphia, where some members had agreed to sponsor a freedom school. The three civil rights workers were arrested and subsequently disappeared. On 3 August their bodies were discovered in an earthen dam. Many other civil rights activists suffered less lethal violence and degradation: over that summer, the Mississippi State Advisory Committee to the US Commission on Civil Rights cataloged 164 civil rights complaints, 52 beatings or injuries, 250 arrests, 4 gunshot wounds, and 13 African American churches destroyed by fire. The violence made the Freedom Summer Project a memorable media story. The 1964 Freedom Summer Project featured (1) voter registration and the organization of the Mississippi Freedom Democratic Party, (2) the operation of freedom schools, (3) the establishment of community centers for African Americans, (4) the white community project, and (5) federal programs research to bring aid to the African American community. Most of the civil rights workers came to assist African Americans in voter registration, inform them of their rights as American citizens, and integrate public facilities. By summer’s end, twelve hundred African Americans had registered, and forty-one freedom schools and community centers had been established. Because of the media attention received by the civil rights workers, the Freedom Summer Project became in many ways the most significant aspect of the Mississippi civil rights movement.